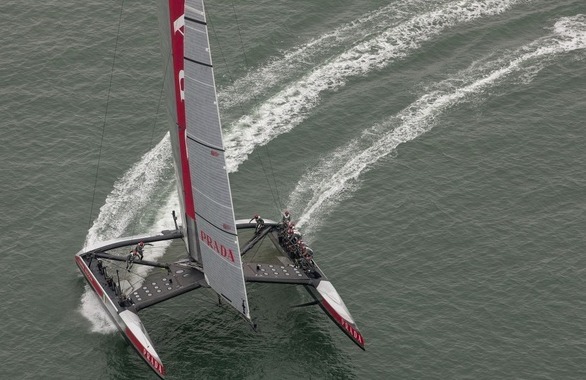 The Golden Gate Yacht Club’s vice commodore said today that club officials are relieved but not surprised that a possible legal cloud over the Sept. 7 start of the America’s Cup Finals in San Francisco has been lifted. “We’re obviously pleased but not surprised” that the African Diaspora Maritime Corp. withdrew its request to a New York state judge for a preliminary injunction delaying the sailing races, said Vice Commodore Tom Ehman. “We’ve been saying all along that there’s no basis for this case,” Ehman contended. The North Carolina-based maritime group claims in a lawsuit filed in New York in 2011 that the yacht club unfairly denied it a chance to compete to be the American defender in the races. A hearing had been scheduled for today before Judge Barbara Kapnick in New York City on the group’s bid for a preliminary injunction requiring the club to reopen the application process for cup defenders. If granted, an injunction would have delayed the start of the race finals. But on Aug. 7, ADM and the yacht club filed a stipulation with the judge saying that the maritime group was withdrawing the preliminary injunction request. The stipulation does not seek dismissal of the lawsuit, however, and preserves the rights of both sides, thus leaving a potential for future proceedings. New York lawyers representing the two sides could not be reached today. The maritime group seeks to train young African-Americans as competitive race sailors and to act as a role model, according to documents filed earlier in the case. The San Francisco-based yacht club is the host of this year’s race. It selected Oracle Corp. Chief Executive Officer Larry Ellison’s Oracle Team USA, which won the previous international competition in 2010, to be the American defender of the trophy. The challenger is being determined in the current Louis Vuitton Cup races in San Francisco Bay, which are expected to wrap up either Saturday or Sunday, unless delayed by weather. ADM contends it could have fielded a viable and diverse defender sailing team, while the yacht club contends it turned down the group’s application because ADM lacked the financial, human and technological resources to have a reasonable chance of winning the defender slot. If ADM had been allowed to compete to be the defender in the 162-year-old race, there would have been a defender racing series in addition to the current challenger series. The organization’s lawsuit was filed in the New York trial court, which is known in that state as the Supreme Court, because a trust deed governing the race was executed in New York in 1877. Documents and letters posted on the court’s electronic docket show that both sides initiated disputes about evidence gathering in the days leading up to Aug. 7. But the documents don’t show whether those disputes played a role in the withdrawal of the preliminary injunction motion. The club’s lawyers filed a notice on July 25 saying they were seeking to take a sworn statement from ADM’s lawyers about who was paying for the lawsuit. Bowman said in a response that the club was willing to stipulate to facts about agreements between the club and the team. Kapnick initially dismissed the lawsuit in January. But on June 25, a New York state appeals court ruled that the lawsuit could proceed on one of its three original claims. That claim is that by turning down ADM’s application, the club acted in bad faith and broke a contract it created when it developed a protocol for selecting a cup defender. The appeals court decision cleared the way for the now-cancelled hearing on the preliminary injunction request.